The concept of the Easter carnival has proved to be popular for shoppers and businesses. At Wainibuku, Nasinu, the Rups Big Bear Nakasi Shopping Complex was a hive of activity as their Easter Carnival Sale came to an end. Members of the public turned up in numbers to take advantage of the sale and services offered by business outlets within the complex. The carnival had Ferris wheel, entertainment rides, business and food stalls. People living along the Suva-Nausori corridor took advantage of the sale. 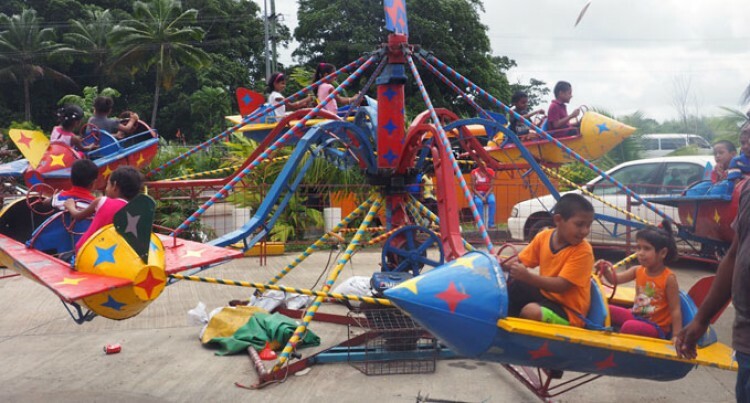 Taraivosa Komaitoga, a resident of Valelevu, Nasinu, said the carnival allowed her to buy for her family. “This is the first time I’m attending the carnival. I just heard over the radio that some stalls are selling things at a very low price,” Mrs Komaitoga said. Rohit Kritesh Sharma, owner of Aussies Clothing Fiji who owns a stall at the carnival, said business was good yesterday. “The carnival was a successful one and I was really impressed with the turnout from the public. During this one week event, the sales were good compared to what we had last year,” Mr Sharma said. Shivani Naidu of Toorak, Suva, whose family owns a barbecue stall at the carnival was surprised with the amount of sale. “We are serving BBQ which includes chops, sausages, eggs, noodles, salad and cassava for $ 6. The sales were good and we had a lot of customers and we were really happy,” Ms Naidu said. The one-week carnival ended yesterday.